I don’r much use this blog for linking to current news, but Charles “Zan” Christensen has a really interesting and important news article over at Prism Comics on indie and LGBT creators not being allowed to sell content via Apple. I’ve been a pretty avid Apple user for years, but this isn’t the first example of their heavy-handed approach to content control. I’ve sporadically thought about digital content distribution over the past year or so, but both Kindle and Ipad have far too many technical restrictions and gatekeepers to make it worthwhile at the moment. I REALLY want to get rid of some of the boxes under my bed so here’s a deal for new SHIRTLIFTER readers: you can order the SHIRTLIFTER party pack, meaning all three issues, for $20 postage included. That’s a savings of almost $6.00 off the cover price of all three issues, more if you factor in pesky concerns like postage. Offer starts now and runs through the end of June. Click the “Add to Cart” button below to order through paypal (offer NOT good through Amazon orders, sorry). If the button doesn’t show up because you’re on an RSS or Facebook feed, then click here. 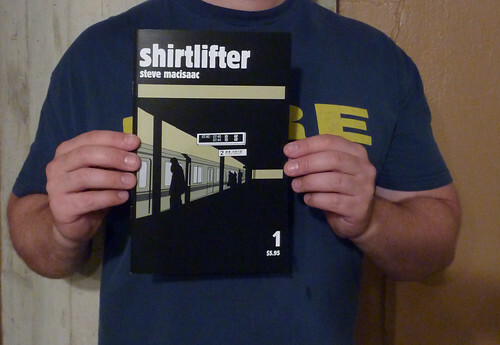 SHIRTLIFTER #1 Reprint is here! 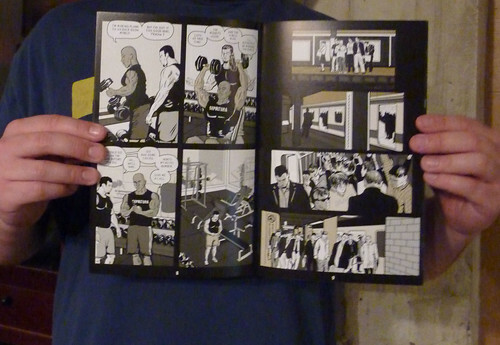 Picked up the new edition of SHIRTLIFTER from the printers and I must say, it looks fantastic. The printing on the new edition is 400% better than the first go around – better paper, and the second color makes the artwork pop much more than the flat grey I used on the first edition. Spent the evening packing up boxes to send to distributors and customers who preordered–only 1800 copies left to go! You can order through my website store or through Amazon . Malcolm Ingram has directed a documentary about the gay bear subculture called, appropriately enough, BEAR NATION. He interviewed me for the film last year and apparently found some usable footage, as I am included in the film. More screenings are constantly being added, and the best place to find out about them is on the film’s Facebook page, which is updated with details regularly. There’s also a trailer, viewable on the official website. Although I do not have a table at TCAF this year, if you are in the area and want to say hi I will be signing in the Beguiling area from 10:00 – 12:00 on Saturday morning. Other than that I will be wandering the floor and attending programming, so the other opportunity to flag me down is at the Queer Artists Mixer Saturday night (see previous post). TCAF takes place at the Toronto Reference Library, 789 Yonge St., Toronto. Hope to see you there! So I will be in Toronto for TCAF (the Toronto Comics Art Festival) but I do not have a table this year. It was sort of a last minute decision to go – it’s basically a pit stop on my way to a conference in Montreal – and I had missed the application deadline. But I’m going anyway, mostly to see what the convention is like on the OTHER side of the table: I always wind up selling books the whole time, and never get to see programming or walk around and talk to other artists. So this is more like a vacation than a typical convention for me. However, I will likely be signing at some point at the Beguiling table (times TBA). The most likely time to get ahold of me will be at the Queer Comics Creators Mixer, which will be happening on Saturday, May 9 from 6:30pm – 9:00 pm at Fuzion Lounge, 580 Church Street. I’ll have copies of my work with me there if you want to pick something up (NOT the #1 reprint, unfortunately – it won’t be ready until I get back). More info about the Mixer (and RSVPs) can be found on Facebook (where else). Sadly there is no Spanish edition of my work (yet), but anyone reading this who lives in Spain should know that SHIRTLIFTER #2 and #3 are now available through the wonderful folks at Libreria Berkana. You can go to their wonderful store in Madrid or order from them online. #1 will be available thorugh them as well after I get copies from the printer. Other Spanish booksellers interested in carrying my work can get copies through Triangulo Distribution. Anyone with tips on LGBT friendly distributors in other countries feel free to drop me a line.